This manuscript contains works of St Augustine (late 4th to early 5th centuries): the 'Confessions' and 'On Heresies'. Augustine, having followed the heretical sect of the Manichaeans in his youth, wrote many tracts against heretics, which remained important through the middle ages because of their reasoning against non-Christian and unorthodox beliefs. 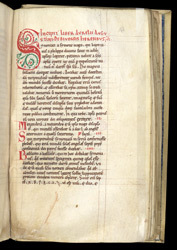 Belonging to the priory of the St Andrew at Rochester, this manuscript would have been studied by theologians and probably for writing sermons. Simon Magus was one of the most detested heretics, partly because, as Augustine says here, he was baptised as a Christian. This page begins his tract against heretics.